I truly believe that the fries at Garden At the Cellar are the best fries in the ENTIRE WORLD. I still have yet to have a better fry, and I've dried them at lots of places! This version looks fantastic too! 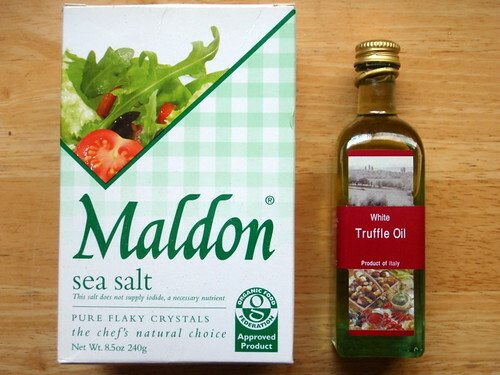 The fake truffle oil is pretty good. :) Honestly, I bet the real stuff will taste much more subtle, and we might actually think it doesn't have enough "truffle" flavor. Properly deep fried food shouldn't be greasy. However, I've always heard frying at too low of a temperature will make something greasy. Maybe this isn't because as the oil gets hotter, the steam coming out of the potatoes starts pushing the oil out? 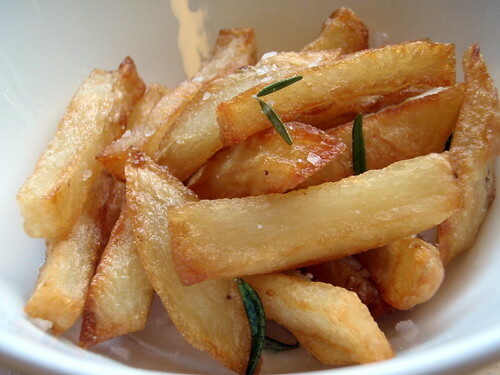 Maybe fried food only gets greasy if you cook it too long, or if you cook it hot and then lower the temperature. 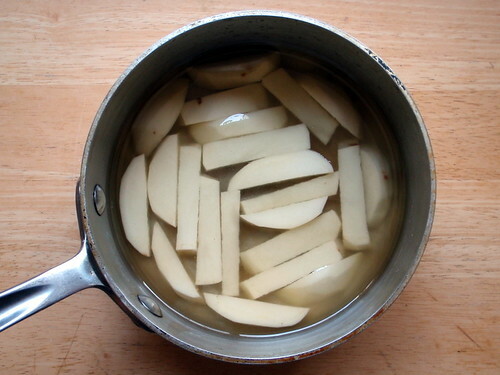 Or maybe because of the nature of the potatoes they can't really soak up the oil? Those look divine, I'm seriously going to have to try this!! Thanks for posting! It's actually the way fries are made in general. They are blanched (300~315f) than fried (375f ish). When the fries are blanched the starches are converted to sugars, then when fried the sugars caramelize forcing out the fat and making the fry crispy. Tried this with the left over duck fat from our Thanksgiving chopped liver. I had two batches so the first was with the room temp duck fat and the other in the heated fat. I have to say the second batch worked out much better than the first. 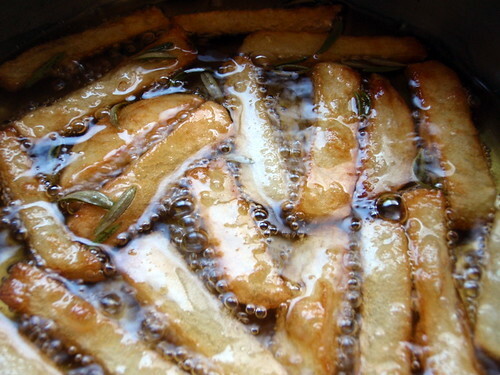 I did not par-boil the potatoes since they were sliced so thin (shoestring/mandolin). It did take about 35-40 minutes for the first batch and 15 for the second. i'm making duck breast tonight and i want to do something with all the fat. i have to add my two cents about the best fries i've ever tried: they came from saffron, a place in downtown minneapolis. so good i could eat them plain and be content but they are served with sheep feta fondue. yum. Here's why cold frying this way is probably delicious but extremely greasy: when you fry something it's a battle of steam coming out of the fry and oil going in. The reason you should fry potatoes at the proper temperature (~320ºF the first time, ~375ºF the second) is that at that temperature there is enough steam coming out of the fry to prevent too much oil from getting in. 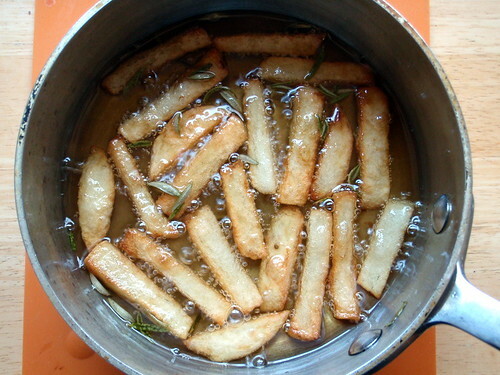 If you cold fry the fries then the oil can easily get into the fry making it greasy. So these probably taste great, but you're not going to get the nice texture you want and it's probably 2-3 times as unhealthy as a properly fried fry. Did you know you can shorten your long urls with AdFly and get cash for every click on your short links.